Garage doors are generally built to last. They’re hugely important for any household’s day-to-day life, and are designed to be tough, reliable and simple to maintain. However, they are put to constant use every single day which can lead to wear and tear over time. If not looked after, they can eventually develop faults which can then snowball into larger problems. These maintenance tips will give you a few simple ways to increase the lifespan of your door, and keep it working at peak efficiency for longer. 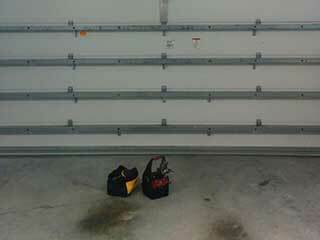 The moving parts in your garage door are usually in action day in and day out. They need to be given proper lubrication to ensure that parts aren’t wearing against each other. Once a year, check the rollers, pulleys, hinges, tracks, and clean off any dirt, grease and dust then apply a light solvent like WD40. Do the same for the pulleys on an extension spring or on the bearings of a torsion spring. If your torsion spring is rusting and binding up, it may be a good idea to wipe a little oil on that too. The door’s opener can be seen as the most complex part of the system, and often requires maintenance. If your opener has a chain drive, wipe a little lubricant along the full length of it. Inspect the opener for any signs of dirt or dust buildup and give it a thorough clean. If grease and dirt has built up on any of the joints or hinges on your door, use an old toothbrush and some kerosene to work away at it. Use some steel wool to clear away any rust, then wipe the surfaces down and lubricate them. All modern garage doors have safety sensors fitted, which detect anything in the door’s path as it descends. Check that these sensors are clear and unobstructed, and give them a wipe clean if any dust has built up on them. While regular maintenance is essential for maintaining the condition of your door, not everything is a DIY job. Our team of expert engineers are highly experienced and can pinpoint any trouble spots - there might be warning signs that a component is wearing out quickly, and it’s vital that this is caught before it completely fails. Professional maintenance appointments are a great way to ensure that your door stays in great shape year after year.